1,Turn on the Left switch of 468 KEY PRO third generation, after turn on it, the main interface pops up. Then click “COPY”. 2, click “CMT46 collect” Upper left corner of the screen. 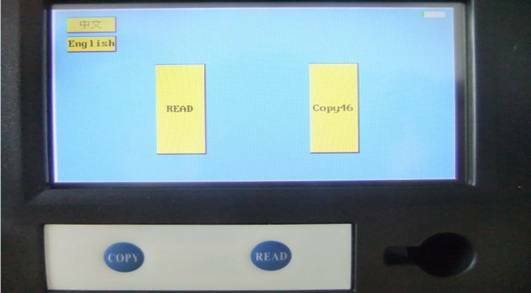 3, This page is a copy of the ID46-chip page, now it is copying ID46 chip. 3.1 Put the original chip vertically into the bottom right corner of the hole, click on ” read UID”. Note: Do not going to be flat on the hole nearby, this is not easy to read information inside the chip. 3.2 Put the new key vertically into the bottom right corner of the hole, click on “Conf ig”. Note: Do not going to be flat on the hole nearby, this is not easy to read information inside the chip. 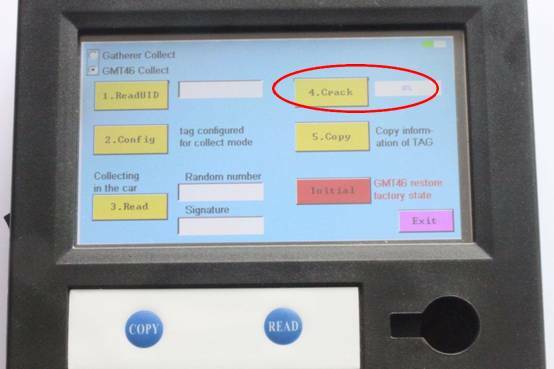 3.3 Use new car key collect information in car, first of all, take a key blank, put the new key into the key blank, insert the car key hole, four consecutive starts, each time interval of 3-5 seconds. 3.4 Put the key which already collected information vertically into the bottom right corner of the hole, click on ” read”. Screen will appear a set of “random number” and “signature”. 4, After crack Original key , put the original key hole vertically into the bottom right corner, click on ” crack”, the screen will display the progress of the original key crack. 5. New key copy. Put the key which already collected information vertically into the bottom right corner of the hole, click on “Copy”. Screen will display “copy successful” message. 6 . If in the process, chip key copy failed, put the key into bottom right corner of the hole, click on “Initialize”, restart again from the first step. VAG Immobilizer emulator VW Audi Seat Skoda A4 A6 Golf ADVISE PLEASE.